Harden insisted Houston’s intensity had nothing to do with their previous two losses against Memphis. 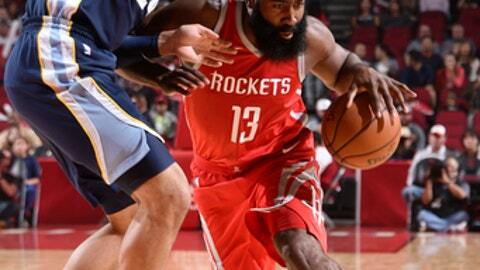 In their 98-90 loss at home to Memphis on Oct. 23, the Rockets were outscored 20-2 in the final six minutes. On Saturday night, they were much more proactive about answering any upswing in Memphis’ momentum. Grizzlies: Memphis’ bench outscored Houston’s bench 50-19, led by Evans’ 22 points and Chandler Parsons, who had 10. Memphis’ bench entered Saturday outscoring opposing second units 483-281. The Grizzlies reserves have outscored their opposing counterparts in every game but one this season. As part of Houston’s new ”First Shot” promotion where a local celebrity attempts a free-throw before tipoff for charity, retired astronaut and U.S. Navy Captain Mark Kelly clanked his shot off the backboard. Kelly sat courtside during the game with wife and former Congresswoman Gabrielle Giffords, Houston Police Chief Art Acevedo and Rockets owner Tilman Fertitta.